Disclaimer: Nothing on this website should be considered legal advice. We're just helping and sorting out some points to comply with GDPR rules. We're not lawyers. Simply, It is a regulation in European law that protects all European individuals under Data Protection and Privacy. The motto of GDPR is to give more control of privacy to the citizens of European Countries over their personal data. This regulation clearly stated that after May 25th, 2018, businesses that are not in compliance with GDPR’s requirement can face large fines up to €20 million OR 4% of a company’s annual global revenue (whichever is greater). That's the major reason that this act created a havoc amongst the businessmen all over the globe. Q. Which individuals are involved to get affected by GDPR? Ans: All businesses which collect any data from EU individuals, any kind of business located under European territory or it could be located outside European territory but having clients or consumers from European territory and collecting their data in any means or in any form. Q. What things are included in 'Personal Data'? Ans: Personal data includes any identifiable information of individual like Name, Address, Contact Number, Email address, IP address, Photograph, Credit Card Number or any Bank detail, any Social Networking profile, health information, income etc. Q. What if my business does not comply with GDPR? Ans: As I stated above, big companies like Google and Facebook have been already penalized by EU. You may face large fines up to €20 million OR 4% of a company’s annual global revenue (whichever is greater). Q. Does GDPR apply to my Blogspot or Wordpress blog? Ans: Yes, obviously! It just applied to every small and large business. But don't panic! As you will not be penalized directly in one go. It will start with a warning followed by a reprimand, then a suspension of data processing of your business, and if you still continue to violate the law, then the hefty fines will hit you. EU government is not an evil, rather it is protecting their individuals from the organizations handling their data and saving them for their use without the appropriate permission of the owner. Once you understand the basics and aims of GDPR correctly, you will get the know how important it is and you can easily comply your blog/website with GDPR. The aim of GDPR is to protect user's personal information and not to let any company or organization store, collect or share any user's personal data without appropriate permission of the respective owner. GDPR regulation has around 200+ pages but I mentioned and described them in the easily understandable language under few points. A business needs to comply with GDPR must declare the below-given points. Clearly, mention what personal information is going to collect in any form along with the stated reason why they need this information. If the collected data is going to be shared with any other third party, like storing emails in case of Feedburner or Mailchimp, IP and Geographical Location etc. in case of Analytics. The website owner must mention the names of third parties along with the reason to share the data. Introduction of Business, its registered address and the names of owner(s). Clearly mention how the user's data is being stored, processed and being protected and not going to be misused in any way. Describe the third parties that provide user's data. Like in case of interest based advertising networks, they will be shown up ads on your blog accordingly to user's interest. You must declare if you are storing user's cookies and the duration until when they are stored. You also need to inform how you're going to enhance the user's experience based on his/her cookies. Your website/blog must be secured. It must not contain any malicious script, plugin or any unauthorized third-party malware. Your blog must be secured with an SSL, if not mention the reason why. You might be using many third-party plugins, widgets, contact forms, payment gateways, Google Adsense and Analytics, etc. on your blog. 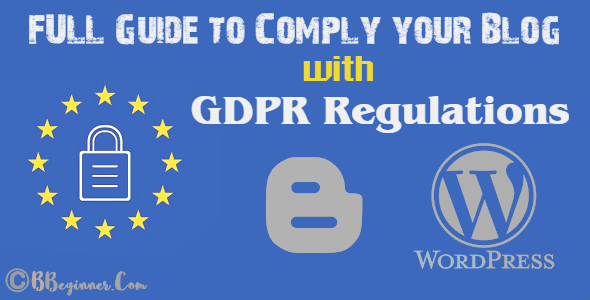 Here I'm going to mention step by step guide which let your Wordpress as well as Blogger (BlogSpot) blog to comply with GDPR. Yes! This is the most important requirement for your blog, especially in this GDPR era. 1. Update your Wordpress (if you're using lower version) as WordPress 4.9.6 and above comes with a built-in privacy generator. 2. Just Log into your Wordpress Admin Panel and head on to Privacy Option under Settings. ♦️ Who we are: In this section, your website URL is specified automatically. You’ll have to add any additional information you want to display on your own. ♦️ What personal data we collect and why we collect it: In this section, you can find several subsections such as comments, media, contact forms, cookies, embedded content from other websites and analytics. ♦️ And a lot more.. In the updated version of Wordpress, admins can now export a zip file containing user's personal data, including the data collected by WordPress and plugins you've installed. Along with this! you can also erase personal data of an individual user. By default, In the update of Wordpress, personal details like name and email address will no longer be saved in browser cookies. Users are given a choice whether they want to save the data in a browser cookie for convenient commenting. The tick-box is unticked by default and must be as such according to GDPR rules until and unless the commentator ticks it manually. Almost all webmasters use Analytics to track their visitors, their behaviour, location, landing page, landing time and so on. For behaviour profiling, Google Analytics extensively collects personal data including IP addresses, user IDs and cookies. So, you need to review and accept the Data Processing Amendment on Google Analytics. Below are the steps to perform this task. 1. To review the Data Processing Amendment, Just Login to your Google Analytics and Click on Admin on the Left Menu. 2. Choose your Account and click Account Settings. If you have multiple accounts then you have to do it one by one. 3. The setting will load in the right. Scroll down a bit. You will find the Data Processing Amendment area. 4. Click on Review Amendment Button. 5. After that, a popup will load with the Data Processing Terms. Read it and click Accept. However, if you’re using MonsterInsights, the most popular Google Analytics plugin for WordPress, then you’re in luck. They have released an EU compliance addon that helps automate the above process. Most of the publishers use Google Adsense to monetize their content. If you're getting traffic from EU territory and you're showing ads to them, then you need to comply with EU User Content Policy on Google Adsense. You can choose whether Google Adsense will show personalized or non-personalized ads to EU individuals. 1. 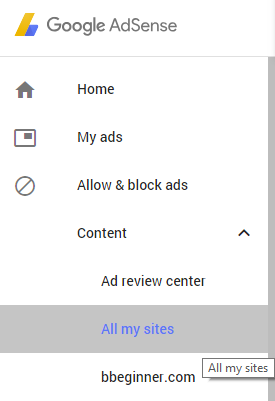 First of all, Login to Google AdSense and Click on Allow and Block Ads on the Left Menu. Select, All my Sites. 2. A list of columns or tabs will load on top. EU User Content Tab will be on the extreme right. Click on it. 4. You can choose between personalized and non-personalized ads, personalized ads are pre-applied so you will see unclickable Save button for it. You can choose non-personalized ads but it will slightly lower your revenue but protect your user's data. 5. Click Save Changes when you are done. Disable storing all form entries. 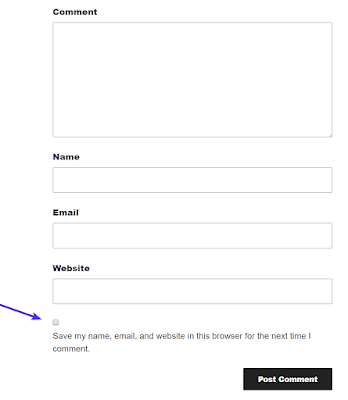 Try to create your contact form direct with just necessary boxes to fill up. Many wordpress plugins like WPForms, Ninja Forms, Gravity Forms do not share your form entries on their site. So, you don't need a Data Processing Aggrement to share visitor's information with third party. Just like contact forms, if you are using any email marketing forms like popups, floating bars, inline-forms, and others, then you need to make sure that you’re collecting explicit consent from users before adding them to your list. WPForms – it is the most user-friendly WordPress contact form plugin offering GDPR fields and other features. Complying a BlogSpot blog with GDPR is quite a difficult task as unlike Wordpress there are no direct plugins which can be installed in a click. You've to do most of the work manually but don't worry we will assist you in step by step so that you can easily create your blogger blog according to GDPR. 🔸 Just head on to your Blogger Dashboard > Pages > New Page. You need to review and accept the Data Processing Amendment on Google Analytics. 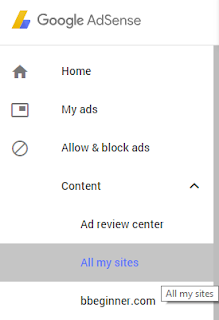 Also, you need to comply with EU User Content Policy on Google Adsense and choose between personalized and non-personalized ads for EU audience. Take a look at Google Analytics and Adsense sections discussed above. The steps are same for both Wordpress and BlogSpot blogs. To comply with GDPR policies, Blogger by default disabled all third parties like OpenID, Tumblr, Anonymous etc. Now you can only comment on blogs having Blogger comment system enabled only if you have a Google Account. You can also create a separate comment policy for your blog and link it just above the comment box. See our comment's policy here. ↠ That's all for today! I hope this guide will surely help you to comply your blog with GDPR policies. We've mentioned all major steps for both WordPress and BlogSpot blogs. We will soon publish more guides on GDPR and many GDPR compatible widgets. If you have any query you can shoot me a comment and I will get back with a best possible solution. Due to the dynamic nature of WordPress and Blogger blogs, no single plugin or platform can offer 100% legal compliance. We are not lawyers. Nothing on this website should be considered legal advice.